Afreximbank President Prof. Benedict Oramah delivering address at IGD Frontier 100 Forum in Washington, D.C. 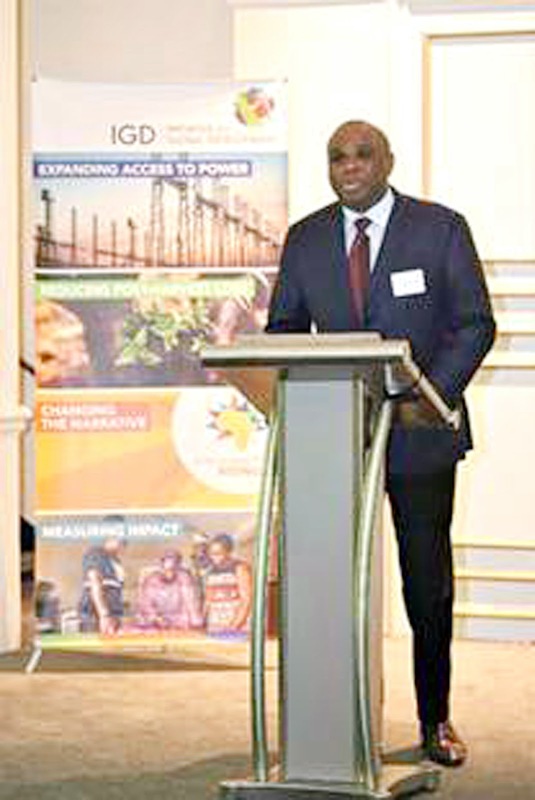 The African Export-Import Bank (Afreximbank) is working, with the support of African Union (AU), to create a digital ecosystem that will eliminate the major bottlenecks to trade finance flows within Africa, Bank President Prof. Benedict Oramah has announced in Washington D.C.
Delivering an address on 11 April at the IGD Frontier 100 Forum organized by the Initiative for Global Development (IGD) on the sidelines of the World Bank/IMF Spring Meetings, Prof. Oramah said that one of the major constraints to intra-African trade was lack of information to support intra-regional trade and investments. That was why many African countries were importing products from outside the continent while neighboring countries were exporting the same products at a much lower cost. Prof. Oramah said that Afreximbank was developing a focused programme to support small and medium enterprises (SMEs) across the continent, recognizing that SMEs were a vital component to unlocking intra-African potential. In his opening remarks Prof. Oramah had noted that IGD has been facilitating discourse on important African issues over the years and said that Afreximbank identified with the efforts and achievements of the IGD, hence its close partnership with the initiative. Prof. Oramah and Dr. Hippolyte Fofack, Afreximbank Chief Economist, who accompanied him to the event, also participated in two panel discussions, on “Supporting Africa’s Growth and Development Agenda” and “Expanding Regional Trade and Investment for Africa’s future”, respectively.